During his interview of Treasurer Tim Nicholls on 7.30 Queensland tonight, Matt Wordsworth cited new Queensland public service data showing job cuts were borne by workers earning less than $100,000 per year, and the number of public servants earning more than $100,000 has actually increased. Mr Wordsworth’s claim appears to be correct, based on figures from the Queensland Public Service Workforce Profiles for June 2012 and March 2013. 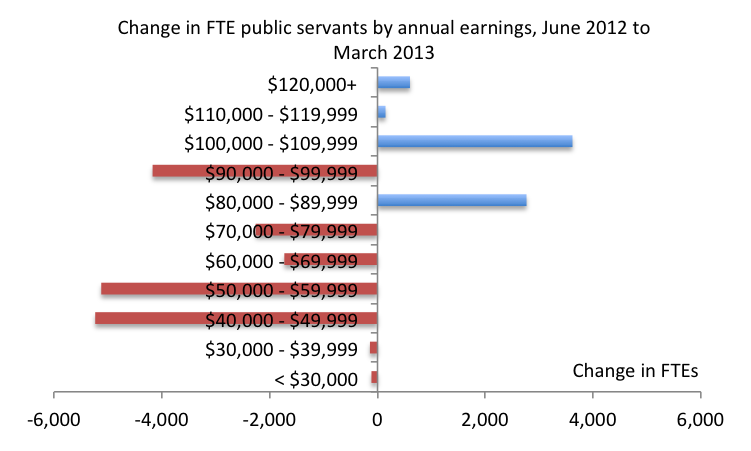 I’ve charted the difference in public service full-time equivalent (FTE) employees between June 2012 and March 2013 for different salary groupings below. Mr Wordsworth’s question will no doubt generate a lot of work tomorrow in public service agencies, which will have to explain to Ministers why they have protected senior public servants. Perhaps the inefficiencies did exist at the lower levels of the public service, but this will need to be explained. To some extent, the growth in numbers at the high end will reflect salary increases that may have already been agreed and which pushed some public servants into higher salary groupings. This entry was posted in Budget, Queensland Government and tagged ftes, publicservants, qldbudget, queensland. Bookmark the permalink.